For 2016, the global advanced energy market surpassed $1.4 trillion in 2016, a 7% increase compared to an updated 2015 total of $1.3 trillion. 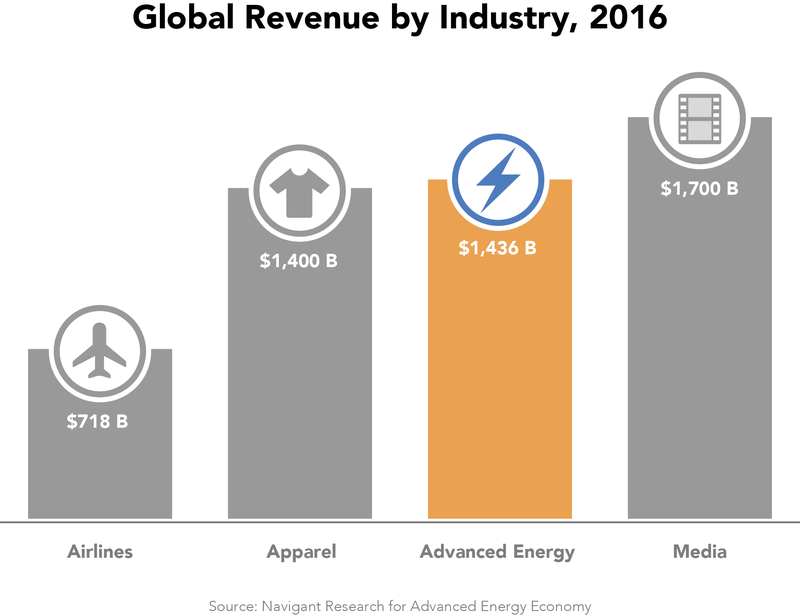 Advanced energy has grown by nearly a quarter (24%) since Navigant Research began tracking for AEE in 2011, adding $257 billion in revenue over six years, counting only data complete for the entire period. Advanced energy is almost twice the size of the global airline industry, and nearly equal to worldwide apparel revenue. Six out of seven advanced energy market segments experienced year-on-year growth between 2015 and 2016, with only Fuel Production experiencing an annual decline (down 3%), driven by sharp drops in ethanol revenue because of low oil, gasoline, and corn feedstock prices. Electricity Generation remained the largest advanced energy segment globally, with $455.6 billion in revenue (up 5% over 2015). Transportation, the second largest advanced energy segment globally, experienced 7% growth over last year and reached $447 billion. At 15%, Building Efficiency capped a fifth straight year of double-digit growth with a record 18% increase, reaching $271.6 billion in revenue in 2016. In the United States, the advanced energy market grew to $199.2 billion, a 1% increase compared to an updated 2015 total of $197 billion. U.S. advanced energy is nearly double beer sales, equal to pharmaceutical manufacturing, and approaching wholesale consumer electronics. The U.S. advanced energy market was nearly 14% of the global total in 2016, consistently representing 13-16% of the global advanced energy market since 2011. Growth in the United States was dampened by a sharp drop in Ethanol revenue driven by low oil, gasoline, and corn feedstock prices. At $20.5 billion, Ethanol revenue represents nearly 10% of the U.S. advanced energy total, so the drop creates a noticeable impact on the overall market. Without ethanol, U.S. advanced energy grew 5% in 2016, three times faster than U.S. GDP (1.6%). U.S. advanced energy has grown by over a quarter (28%) since AEE began tracking in 2011, for an average of nearly 5% annually. This represents an addition of $39.6 billion in revenue over six years, counting only segments with data for the entire period, and outpacing the global market growth during that time. At $68.8 billion, Building Efficiency is the largest advanced energy segment in the United States, in contrast to the global market, which is led by Advanced Electricity Generation. Building Efficiency experienced the second largest year-on-year growth at 9%, led by the Lighting, HVAC, and Building Envelope categories. Since Navigant Research began tracking, this segment has grown steadily at an average of 10% annually, adding an average $4.5 billion in new revenue each year. Several product categories have more than doubled in size over the six years covered in this report, including Home Energy Management Systems, Intelligent Lighting Controls, Residential Demand Response, and Building Information Modeling. Advanced Electricity Generation was the second largest advanced energy segment in the United States, at $52.2 billion in 2016, and experienced 8% year-over-year growth. Led by Solar, Wind, and Gas Turbines, this segment represents over a quarter of the U.S. Advanced Energy market. Despite cost declines, Solar PV revenue in 2016 led all the other product categories with $24.9 billion in revenue – a record high for the six years AEE has been tracking. Solar PV revenue was nearly half of the U.S. Advanced Electricity Generation segment total. Wind, a product category that has seen cyclical swings over the past six years, held roughly steady at $14.1 billion in 2016. Gas Turbines were down to $9.2 billion, a fall of 12% over 2015. Fuel Production remained the third largest advanced energy segment, with $28.9 billion in revenue, but continued its two-year decline, down nearly 19% in 2016. Ethanol revenue, which makes up most of the Fuel Production segment, is a substantial portion of the U.S. advanced energy total. The price of ethanol is heavily influenced by oil, gasoline, and corn feedstock prices, all of which were low in 2016. While most liquid fuel product categories (led by Ethanol) declined, production of natural gas for transportation fuel continued to grow in 2016. Advanced Transportation was the fourth largest segment with $21.8 billion in 2016 revenue, down 5% due to the continued reduction in Clean Diesel Vehicle and Hybrid sales. Despite this year’s setback, over the six years of tracking the Advanced Transportation, it has nearly doubled from a relatively small starting point of $11.7 billion. Plug-in Electric Vehicles (PEVs) continue to surge at 48% growth compared to 2015. At nearly $7.8 billion in revenue, PEVs are beginning to catch up to Hybrids, at $8.9 billion, and if the trend continues could overtake them this year. Likewise, Fuel Cell Vehicles experienced substantial growth. This category saw the second straight year of triple digit annual growth, from $670,000 in 2015 to $6 million in 2016. Industry grew 8% over 2015, slightly below the 11% average annual growth over six years. At $8.2 billion in revenue in 2016, this segment has nearly doubled over the six year period. Industrial Combined Heat and Power (CHP) has exhibited especially strong growth, from just over $1 billion in 2011 to $3.5 billion in 2016. Electricity Delivery and Management, which includes product categories related to smart grid, microgrid, electric vehicle charging infrastructure, and energy storage, increased 3% to $14.5 billion in revenue in 2016. Growth in this segment was led by Energy Storage (up 54% to $427 million) and Microgrids (up 16% to $2.2 billion). Fuel Delivery reached $178 million in 2016 (down 4%), continuing its two-year decline. Low oil prices are a major impediment to natural gas vehicle purchases and, to a lesser extent, investment in fueling infrastructure. In addition to quantifying the 41 advanced energy subsegments (each with multiple product categories) that make up the advanced energy market, this report features 17 trend stories across the seven market segments, which we will be serializing here, on Advanced Energy Perspectives. These trends can be rolled up into five over-arching trends, which, among others, are shaping the future of advanced energy. You can read them all now by downloading the report! The Rise of Big Data Analytics: The use of software engines and algorithms to process and analyze large quantities of data and provide insights into how customers behave is changing the way companies do business across the economy, and energy is no exception. The Big Data Drives Demand Side Management Innovation story features how, in recent years, utilities and energy efficiency providers have used new data tools (home energy reports, web portals, and mobile apps) to unlock cost and energy savings for customers. Energy Use? Yes, There’s an App for That profiles energy applications that are targeting the $2.3 billion global Residential Home Energy Management Systems market. Meanwhile, amid the digitalization of energy, which has offered up the Internet of Things (IoT), connected devices, smart grid, and even autonomous vehicles to consumers, new challenges have arisen, including cybersecurity, which we discuss in As the Grid Goes Digital, Cybersecurity Gains Importance. Hardware Cost Declines: Advanced energy technology deployment continues to exhibit dramatic growth rates, enabled in large part by cost declines in hardware such as solar PV modules (See Solar PV Sets New Records Nationally and Globally), LED lighting, and increasingly battery technology – with gigafactories being built around the globe to produce these items at scale. The extreme pace of these cost and commensurate price declines have restrained market revenue growth as outlined in this report. In response to increasing market maturity and tight margins, advanced energy companies in many sectors are undergoing a shift to services, as discussed in the Lighting as a Service Market consolidation/vertical integration, scaling of manufacturing, and fierce competition will drive further cost reductions in the future. The Next Frontier is Already Here: A number of industries have reached tipping points or otherwise hit major milestones in 2016. For example, the first offshore wind project in the United States reached completion off the East Coast (see Rhode Island Lays Foundation for U.S. Offshore Wind). With a 1,000% increase in revenue since 2011, the Plug-in Electric Vehicle market is now eating into the traditional hybrid electric vehicle market in the United States and could surpass it in terms of revenue in 2017 (see Plug-in Vehicle Options Expand, Stimulating Rapid Growth). Meanwhile, the power of national policy priorities in China, the United States, and Japan continues to stimulate markets for solar PV, biofuels (see Biofuels Meet Targets), hydrogen vehicles and infrastructure (Can Toyota, Honda, and Hyundai Make Hydrogen Work? ), and Combined Heat and Power (CHP provides Onsite Power Generation for Industrial Customers, and Others). Infrastructure for the Future: Replacing, Retrofitting, and Digitalization: The supply – and pricing – of incumbent fuels and technologies will continue to impact advanced energy market growth in the future. For example, low oil prices affect natural gas vehicle (NGV) sales and infrastructure (see Natural Gas Fueling Stations Continue Slow Buildout). On the other hand, Smart Transmission, Distribution Automation Systems, and Advanced Metering Infrastructure (AMI) Systems are now mainstream, as the digitalization of the electric-mechanical infrastructure moves forward. As a result, the grid will increasingly resemble a more sophisticated – but also resilient and distributed – networked system, as we discuss in Energy Storage Becomes the Glue for Virtual Power Plants. Consistent with previous editions of the Advanced Energy Now Market Report, the combination of revenue data, trend stories, and forecasts highlight the broad, innovative, and evolving advanced energy marketplace. During the six years that Navigant Research has tracked the advanced energy market for AEE, this report has highlighted the pivotal role played by the United States in developing new technologies, but also in new business models that have enabled overall market growth, despite the changing landscape. Navigant Research expects this trend to accelerate in the coming years as these technologies and solution offerings continue to scale.